BRYAN EATON/Staff Photo. 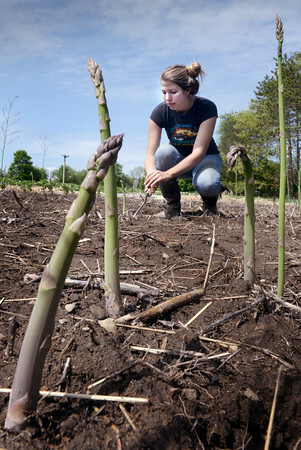 Brazilian exchange student Beatriz Barreira harvests asparagus, one of the first crops of the year, at Bartlett's Farm in Salisbury on Monday. Farmers and gardeners alike are hoping for rain as the area is several inches below average so far this year.